A gold color metal and enamel insignia 1 3/16 inches in height consisting of a disc equally divided by three radiating partition lines, the upper line vertical, white, gray and black, the disc beneath a gold scroll inscribed POTESTAS PERSUASIONIS in black letters and above a gold wreath of ten laurel leaves, the top leaves surmounting the scroll; overall a gold equilateral triangle with concave sides and one point up bearing three red tongues of flame conjoined at the center and radiating toward each angle of the triangle. The flame stands for light and wisdom; its three tongues point toward the three areas of propaganda with which the Battalion works. 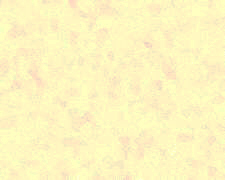 These areas are represented by the white, gray and black portions of the disc. The white color stands for acknowledged, true propaganda, the gray for propaganda emanating from a source not identified, and the black for propaganda from a source other than the truth. In addition, the flame, a symbol of unceasing activity and of good will, alludes to the continuous efforts of the organization to win hearts as well as minds by persuasion and truth. The triangle is a version of the Greek letter delta; it stands for the Mekong Delta where the 10th Psychological Operations Battalion was activated and served during the Vietnam conflict. The triangle is also a symbol of the psychological operations technique, i.e., the introduction of the first small point of an idea (represented by the apex), and its subsequent enlargement and widening (represented by the base). The colors gold and red are taken from the national flag of the Republic of Vietnam. They stand for excellence and courage and refer to Vietnam and to the Battalions activation and service in that country. The wreath of laurel leaves refers to victory achieved by persuasion. The leaves are ten in number in allusion to the Battalions numerical designation. Background: The distinctive unit insignia was authorized on 25 November 1968. Shield: Vertical, above a wreath of ten laurel leaves, a roundel tierced in pairle reversed Argent, Gray and Sable fimbriated Or superimposed by a triangle with concave sides of the last charged with three tongues of flame conjoined Gules. That for the regiments and separate battalions of the Army Reserve: From a wreath, the Lexington Minute Man Proper. The coat of arms was authorized on 16 April 1996. The 10th PSYOP Battalion has a long and honored history starting with its formation in Vietnam. The story of the Battalion starts with the 19th PSYOP Company that was activated at Ft. Bragg N.C. as part of the 3rd Special Forces Group on 10 August 1962. 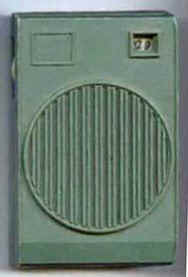 It deployed to the Dominican Republic during Operation Power Pack in 1965. On 19 November 1966 it was deployed to Can Tho Vietnam as part of the 6th PSYOP Battalion to provide advice and support to military units and agencies in the Mekong Delta in IV Corps Tactical Zone. 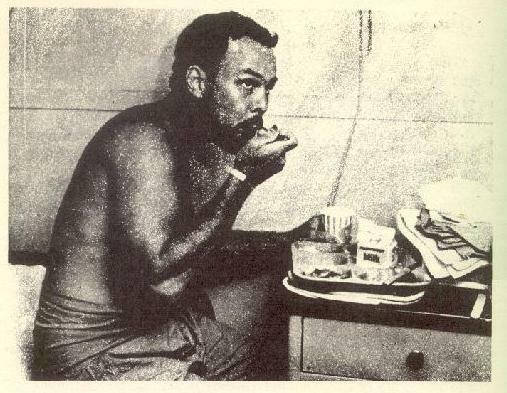 The three commanders of the short-lived 19th PSYOP Company were: Captain Blaine Revis (November 1964 to September 1965); Captain Howard F. Gregory (October 1965 to October 1966); and Major James T.L. Dandridge, II (March 1966 to September 1967). 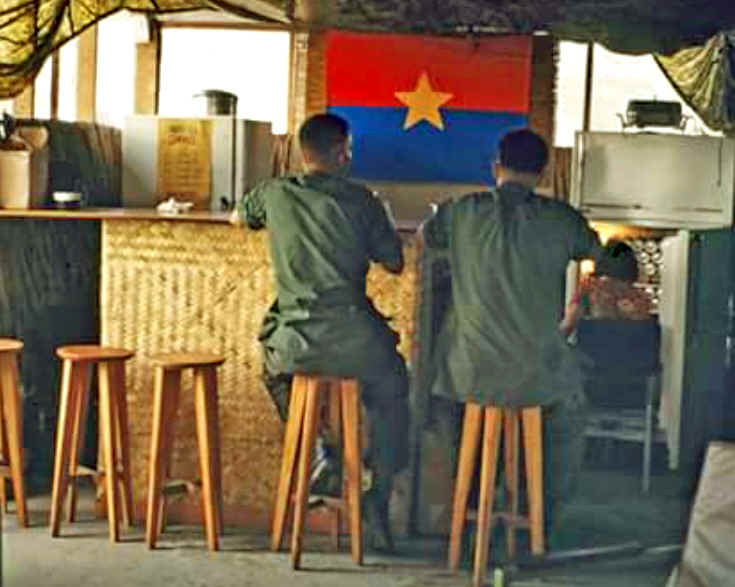 In the first nine months in Vietnam, the 19th PSYOP Company participated in 26 operations, produced 12 million leaflets, and distributed 450 million national leaflets. Personnel took part in 1,500 aerial missions and conducted over 400 hours of aerial loudspeaker broadcasts. During the reporting period 217,522,500 leaflets were disseminated by air and other means. Of this total 12,865,000 were printed by this company. 210 hours of aerial loudspeaker messages were broadcast. The 19th PSYOP Company continues to render psychological operations support to the 2nd Brigade, 9th Infantry Division (U.S.). Psychological operations support to the Riverine force of this Brigade, Initiated during the last quarter in the III Combat Tactical Zone, has proven extremely successful. This unit has field teams supporting all three of the South Vietnamese Army (ARVN) Divisions in the IV Combat Tactical Zone. They are the 7th Infantry Division at My Tho, the 9th Infantry Division at Sa Dec and the 21st Infantry Division at Bac Lieu. In addition, the 19th has field teams attached to the 244th, 245th and 246th PSYOP Companies. River operations have been initiated in the 7th ARVN Infantry Division Tactical Area utilizing two two-man speaker teams and a UHI-5 sneaker set from the 403rd ARVN PSYOP Company which is mounted on U.S. Navy PBR's of Task Force 186. Operating out of My Tho, the PBR's broadcast Information programs to Civilian River traffic by day and harass known Viet Cong units by night, varying movements and areas. 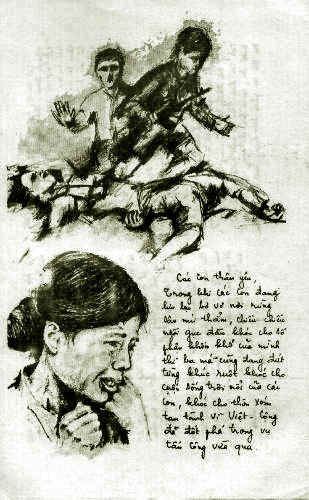 Information gained from a Hoi Chanh who rallied because of the broadcasts Indicates that Viet Cong cadre are furious because of the effectiveness of night boat and aircraft broadcasts. These Hoi Chanh were used to record messages to their friends which were in turn played back by the PBR's. Although command of the four tactical companies lay with the commander of the 6th PSYOP Battalion, operational control lay with the four major area commanders in the Corps zones. During this period, the Joint U.S. Public Affairs Office (JUSPAO) had numerous United States Information Agency (USIA) representatives operating throughout the country. These civilians maintained close contact with the four tactical companies within the 6th PSYOP Battalion. In late 1966, the USAF selected a military variant of the Cessna Model 337 Super Skymaster to supplement the 0-1 Bird Dog forward air controller aircraft then operating in Southeast Asia. 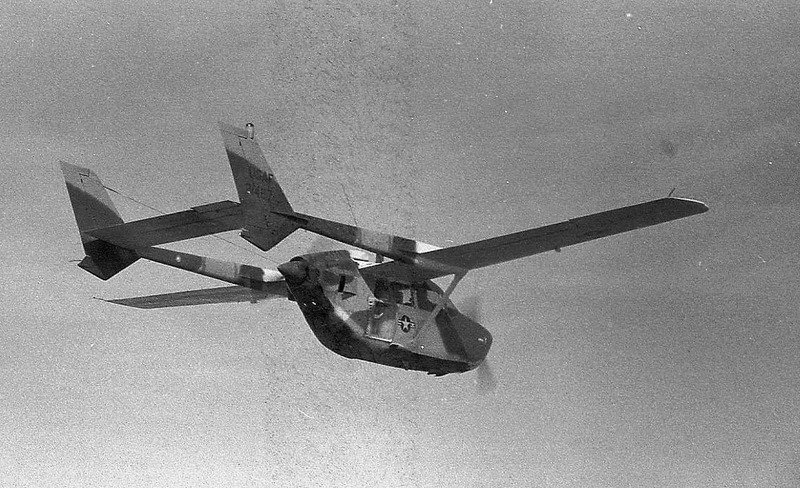 Designated as the 0-2, the aircraft was distinguished by twin tail booms and tandem-mounted engines. Having twin engines enabled the 0-2 to absorb more ground fire and still return safely, endearing it to its crews. The 02-A had hard points on the wings for weapons and rockets. The 02B had no weapons but was designed to carry loudspeakers and disseminate propaganda leaflets. The photograph was taken by photographer Rick Levine who took enemy fire on this mission. In August 2018, I was asked by the Todd Faulkner, host of the WPSD TV news-series The Wall that Heals if I could help with a story they were doing about the traveling replica of the Vietnam Wall coming to Paducah, Kentucky. 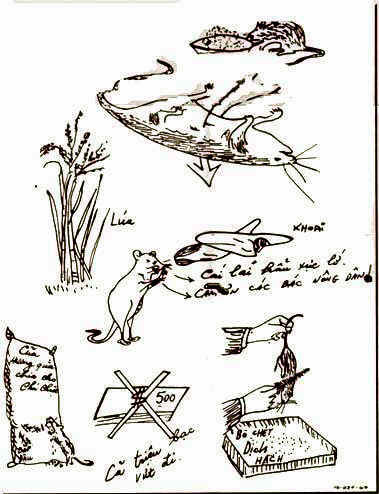 Bob McGaughey, a former member of the 19th PSYOP Company in Vietnam was being interviewed and they needed images of the leaflets he would discuss. I gave permission for the TV station to use the images. Ill tell you what we did in Viet Nam: You had leaflet and loud speaker units, you had a printing unit. Teams of people printed small leaflets to drop by plane over enemy territory. Mainly, we had something called Chieu Hoi. These were little leaflets that said Come in, surrender now and you should not be with the Viet Cong. And with them, we had whats called Safe Conduct Passes that were red, white and blue with some yellow on them. They were the Safe Conduct. So, they could show this and say Chieu Hoi and come in, they wouldnt be shot. They would be accepted on that. As for close calls, Bobs pilot was hit in the leg in their small aircraft while on a leaflet dropping mission and a Viet Cong sapper used a satchel charge to try and blow up his building in Can Tho. They took out a wall but Bob was not there that night. 150,000 copies of this leaflet were produced at the request of the 3rd Brigade of the 9th Infantry Division. The theme is: We Come as Friends. The leaflets were designed to be airdropped and targeted the civilians in the 9th Infantry Division area of operation. Units of the 9th US Infantry Division have come to Dinh Tuong Province at the request of the Government of the Republic of Viet Nam for the purpose of helping the Vietnamese maintain their independence and protecting their freedom. The presence of American forces will not interfere with the lives and property of the people. They will not obstruct farming or freedom of commerce of the people. American soldiers have come to help annihilate the Viet Cong; to prevent the VC from killing and taking peoples property. You are urged to cooperate with the Americans to discover and block each cunning plot of the Viet Cong. You are urged to leave each time the Viet Cong come to your locality and report to the Army of the Republic of Vietnam or the Allies the positions and installations of the Viet Cong. Stand still when you see American units on an operation; carry your identification card; and respect the curfew in your area. This leaflet depicts American soldiers helping the Vietnamese people with supplies and medical care. 50,000 of these leaflets with the theme of Cooperation were prepared to be handed to civilians in the 9th Infantry Division area of operation. Your true Government is daily improving life for its people with more food, clothing, better roads, schools for your children and more and better medical facilities. With the aid of the US and 42 other free nations, your government is speedily bringing a fuller, richer life for all. Viet Cong! This is a sign of death! Continue your struggle against the National cause and YOU will surely die a mournful death like this! 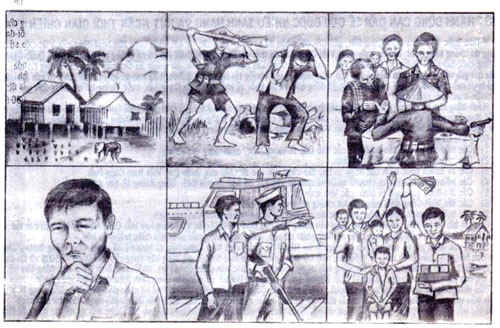 This leaflet is in a cartoon style and depicts a farmer being drafted by the Viet Cong, lectured, then having second thoughts and informing on the Communists. In the final picture he is shown with his happy family holding presents in one hand and cash in the other. He was amply rewarded for informing on the guerrillas. 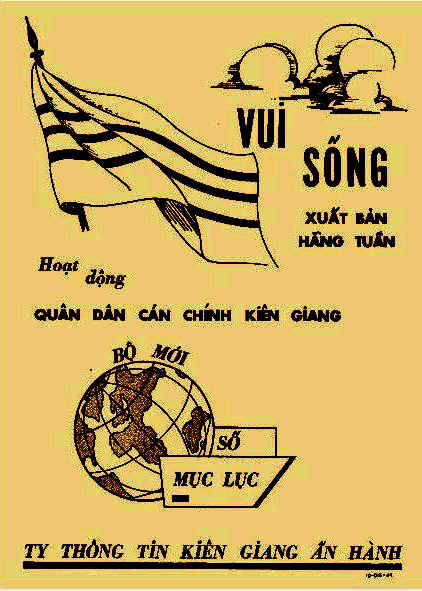 Since there is no text on this leaflet and it is written in a cartoon style it would clearly seem to be for those Vietnamese who could not read. The message is still very clear. Since U.S. operations in Cambodia were secret. the operation was called Camel Path. leaflets were all printed at the same time and not mixed with other leaflets for Vietnam proper. On this sheet I see CP-03A, CP-05A, CP-06A, CP-08A, CP-09, CP-55A, CP-1387A, and R-2. This is an interesting mix. 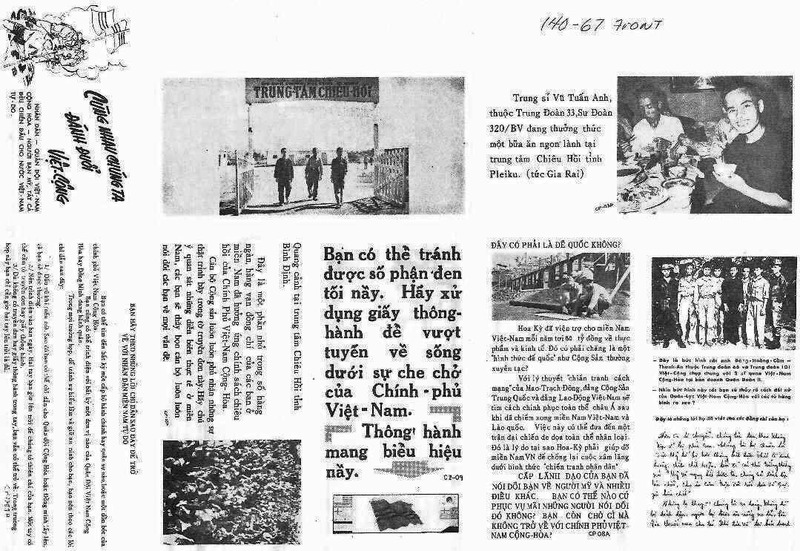 The seven A leaflets all seem to be additional, or leaflets that bear some text or images in common with leaflets to Vietnam. So even though these were classified secret, apparently they stole much of the propaganda from standard leaflets for Vietnam. The R-2 is even more interesting. It is a scrap leaflet designed to fill in an empty place on the sheet so the printers get full value out of every sheet. To give an example of the way the leaflets were prepared and dropped I note from a leaflet order sent to the 7th group for a mix of six Camel Path leaflets ordered in November 1967 for dissemination in January 1968. The leaflets are CP-02, 08A, 09, 10, 55A, and 1389A. All are black and white and sized 3 x 6-inches. 5 million of each was ordered. They would be placed in a mix and dropped together. The leaflets were forwarded to the respective PSYOP companies. 15,000,000 were for 245th PSYOP Company in Pleiku, 10,000,000 for the 246th PSYOP Company in Bien Hoa and 5,000,000 for 19th PSYOP Company in Can Tho. On 1 December 1967, due to the increasing need for more PSYOP personnel, the 6th PSYOP Battalion was redesignated the 4th PSYOP Group; the 244th PSYOP Company was redesignated the 7th PSYOP Battalion; the 245th PSYOP Company was redesignated the 8th PSYOP Battalion; and the 19th PSYOP Company was redesignated the 10th PSYOP Battalion. Commanding General, Delta Military Assistance Command (DMAC), IV Corps Tactical Zone; Civil Operations and Revolutionary Development Support (CORDS); 9th Infantry Division; Naval Forces, Vietnam; 40th POLWAR Battalion (Vietnamese Army); Company D, 5th Special Forces Group; Military Assistance Command, Vietnam (MACV) Advisory teams. 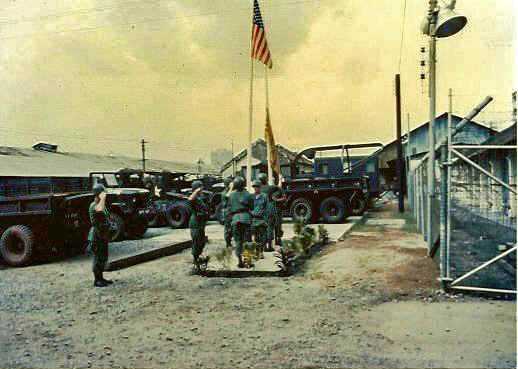 In IV Corps, the 10th PSYOP Battalion was formed from the 19th PSYOP Company at Can Tho, where it operated until it departed Vietnam on 16 April 1971. 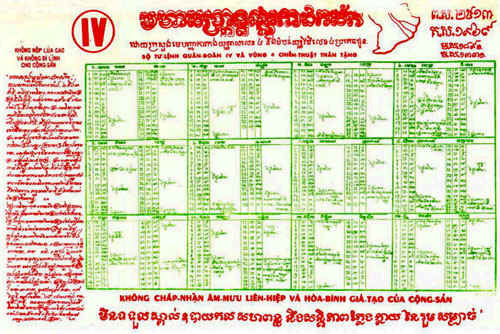 The 10th maintained 15 field units in IV Corps: Bac Lieu; Ben Tre; Ca Mau; Cao Lanh; Chau Doc; Dong Tam; Go Cong; Long Xuyen; Moc Hoa; My Tho; Rach Gia; Sa Dec; Soc Trang; Tra Vinh and Vinh Long. Headquarters had four printing presses that could produce three-color leaflets in runs of about 100,000. Larger orders were usually printed by the 7th PSYOP Group on Okinawa. The 10th flew five or more leaflet-drop missions a day, often using C-47 aircraft. The battalion mission in each corps tactical zone is two-fold; first, to provide psychological support to all U.S. combat units. This support includes the use of field teams equipped with powerful ground loudspeakers and audio-visual equipment. Habitually operating with front-line fighting units, loudspeaker teams provide close support to tactical operations and are highly successful in this role. Secondly, the battalions are required to support non-military pacification or internal development programs. For example, they employ audio-visual Jeepsters in support of revolutionary development, civic action and medical aid projects and programs throughout Vietnam. The latter role appears to be an ever-increasing one for the 4th PSYOP Group. Field teams of the Group have been part of every major combat operation in Vietnam since February 1966, including Operations Cedar Falls, Byrd, Hastings and Manhattan. The battalions work closely with the Air Force 14th Special Operations Wing, elements of which are co-located with the PSYOP Battalions. The Special Operations Squadrons fly leaflet and loudspeaker missions which are requested and targeted by the battalions. Reveille at the 4th PSYOP Group Cruz Compound on Pham Ngu Lao Street in Saigon. The Cruz Compound was located at 16 Pham Ngu Lao Street in the Saigon rail yards. Staff Sergeant Pedro A. Cruz was a member of the 19th PSYOP Company (later the 10th PSYOP Battalion) who was killed by enemy fire in May, 1967, while continually placing himself in danger to keep a loudspeaker transmitting in support of the 101st Airborne Division. He was awarded the Bronze Star with V device for valor. The 4th PSYOP Group Headquarters was named the Cruz Compound shortly afterwards. On October 29, 1963, Special Forces Officer 1st Lieutenant James "Nick" Rowe was one of several Special Forces advisors assisting the Vietnamese government in the training, equipping and employment of the Civilian Irregular Defense Group (CIDG) forces. The team (Detachment A-23) left their camp at Tan Phu for the village of Le Coeur. Along the way they ran into an ambush and Rowe was captured. For 62 months, Rowe battled dysentery, beriberi, fungal diseases, and grueling psychological and physical torment. Each day he faced the undermining realization that he might be executed, or worse, kept alive, but never released. His home was a wooden cage, three feet by four feet by six feet in dimension. His bed was a sleeping mat. In spite of all this, Rowe was a survivor. From the start of his capture, he began looking for ways to resist his captors while he could make plans for his escape. Rowe made several unsuccessful escape attempts which only resulted in furthering angering his captors. Finally in December 1968, his captors had had enough with his refusal to accept the communist ideology and his continued escape attempts; Rowe was scheduled to be executed. 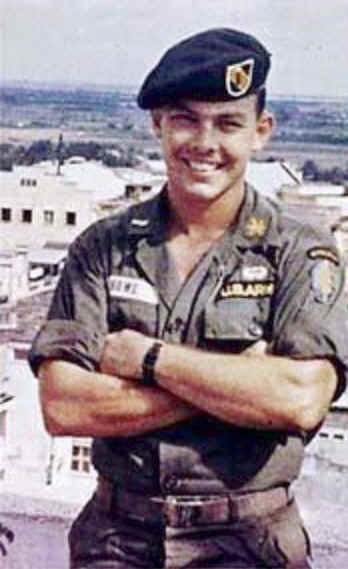 On 31 December 1968, while away from the camp in the U Minh forest, Rowe took advantage of a sudden flight of American helicopters. He struck down his guards, and ran into a clearing where the helicopters noticed him and rescued him, still clad in black prisoner pajamas. 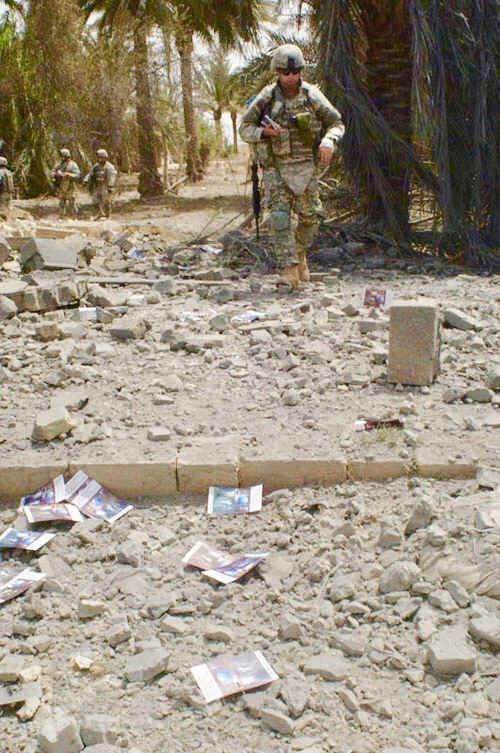 The experience of one Special Forces Office, Lt. James 'Nick' Rowe, formed the basis for at least one US PSYOP leaflet. Rowe had been held in a Viet Cong bamboo cage for no less than five years, but just before his escape he had noticed that his captors were confused and bewildered because their old sanctuaries were being invaded by what had been dismissed by their cadres as 'weak' United States and Government of Vietnam forces. Many of them would have liked to give up the struggle but were afraid of being killed while trying to defect. A leaflet was quickly printed up with a message from Lt. Rowe reassuring his former captors that they would be welcomed and treated decently. I am First Lieutenant Rowe. On 31 December 1968 I was liberated by American and ARVN forces. I am now in a hospital feeling very good, and have met with my friends. I miss you and want you to also be treated well, instead of being shot down on the field. In these past few days I saw this clearly: the information I received in prison about the war, about the troop morale of RVN and American soldiers, about the victory of the Liberation troops, is completely untrue. At the present time it is clear that RVN soldiers are ready to fight, American helicopters are powerful, and you cannot win. I appeal to you to surrender when you see RVN soldiers or American helicopters. Don't be afraid of being beaten or shot to death. I promise you that you will be treated well and you will be provided a mosquito net, clothes, food, etc. You allowed me to live and now I want you to live. If you bring more American prisoners to the Government Zone, you will be awarded 600,000 $VN and be treated very well. Lieutenant Rowe documented his POW experience in a book titled Five Years to Freedom. He also went on to attain the rank of Colonel and became a legend in the world of Special Forces. Everyone remembers the old Batman TV show from around the mid-1960s. Someone in our Propaganda Development Center thought that the idea of a bat signal was a good one that could be used in psychological operations. He thought that we might be able to take a transparency and place it into a projector, turn on the intense illumination and manipulate the focusing lens, and then project an image out great distances. 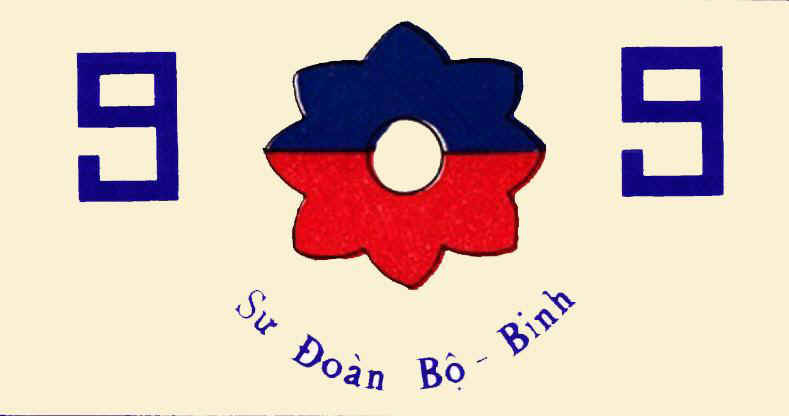 He envisioned using such symbols as Chieu Hoi (open Arms) or the flag of the Republic of Vietnam. Once the projector and transparencies were prepared and ready I had to obtain a power source to run to run the high-wattage projector lamp. An Army 3.5 kilowatt generator set was obtained and placed in our loudspeaker (Gabby) C-47 aircraft. The commander of the 5th Special Operations Squadron was unhappy about that extra power source in his aircraft, but eventually he went along with the experiment. The ideal clouds would be a low-hanging mattress blanket cloud cover, but in the Delta they were not all that common. On a less than ideal night Gabby took off and flew a mission provided by our S3 shop. We usually targeted large Viet Cong formations and I believe this was a suspected VC battalion. The illumination unit worked and the image was projected, but there was no way of determining how well it was seen without a prisoner to interview. The next mission was over Vinh Long and our field team witnessed the projection and reported that it was blurry and not very effective. The problem was the transparency of the cloud cover. It was not dense enough, and on that particular mission the cloud cover was so low that it was extremely dangerous for the aircraft and the safety of the crew. Angels 3 was considered the nominal altitude for safe operation and the low cloud cover would bring Gabby within 1500 feet of the Viet Cong muzzles. That was simply not going to happen. Still, even under those poor conditions there was an image. We had proven that the system should work under perfect conditions and had proven that messages could be projected onto low-floating clouds with the use of a projector and portable generator. The operation itself proved a failure. After the second mission, some members of our staunch allies, the Army of Vietnam (ARVN's) were seen running off with our generator set from what had once been a locked storage shed at Binh Thuy Vietnamese Air Force Base. Without the power source all further missions were cancelled. Those spotlight missions were innovative and showed a great deal of originality and imagination, but unfortunately it would take a lot more to defeat the Viet Cong insurgency. Curiously, this was not the first use of such an image projection. The British looked into such a program in March 1940, and 50 years later the U.S. Army considered a similar operation during Operation Desert Storm. According to the Operations Report � Lessons Learned Headquarters 10th Psychological Operations Battalion period ending 31 January 1968 dated 6 February 1968 the 10th PSYOP Battalion dealt with a group known as the KKK, a quasi-bandit guerrilla band of Cambodian extract operating along the Cambodian border in Chau Doc province. The KKK was organized in company and battalion levels and constituted a threat to the local government and administration by taxing the people and in some instances attacking villages and assassinating leaders. Between 24 December 1967 and 3 January 1968, 185 of these KKK bandits rallied to the GVN. An arrangement was worked out by province officials and they offered full Chieu Hoi type benefits to the KKK members although current GVN policy does not classify the KKK as being eligible. Seizing the possibility of influencing the KKK personnel of the 10th POB dispatched 2 field teams to the area to determine conditions and make leaflet and loudspeaker appeals. During Operation Kon Tiki sealed plastic bags containing the rural magazine Hong Que, the newspaper Tu Do, propaganda leaflets, a Vietnamese flag, and small miscellaneous gifts were set adrift in Delta waterways leading into VC controlled areas. The objective of the operation was to overcome the measures employed by the VC to limit the effect of leaflet and loudspeaker propaganda. The operation was completed as planned. On 13 May 1968, from 0400 through 0615 hours, 153,000 plastic bags were disseminated. Area of dissemination included 43 points within 11 provinces. A total of 85 Navy PBRs participated in the operation. Following the distribution phase, aerial and ground observation teams were sent into the target area to determine if the bags were picked up. The observation teams reported no bags sighted. Civil Operations for Revolutionary Development Support/Psychological Operations reported the operation may have contributed to the increased Chieu Hoi rate which followed the operation and continued for two weeks. A Hoi Chanh from Phong Dinh province, interrogated at the Phong Dinh Sector Chieu Hoi Canter, stated, I read a directive ordering me to inform the people in my area not to touch the bags because they were poisoned." He further stated he had not seen any of the bags in his area. A third theme is being developed to encourage participation in civil defense organizations. Initially, 60,000 bags (20,000 per theme) will be disseminated. Upon receipt of feedback indicating positive effectiveness, the battalion will continue to develop and print messages in support of the campaign. The 10th flew 5 or more leaflet-drop missions per day, using two C47 aircraft and U-10 HelioCouriers. The USAF 5th SOS located at Binh Thuy Vietnamese Air Force Base had two C47 Gooney Birds plus six U-10 Super HelioCouriers. These were also used elsewhere in IV Corps. The unit was awarded the Meritorious Unit Commendation (Army) for Vietnam 1967-1968, and the Republic of Vietnam Civil Action Honor Medal, First Class for Vietnam 1967-1970. Another interesting mission occurred in January 1968 when a study was completed and plans were formulated for a project to reach the population of tightly controlled Viet Cong areas by means of attractive waterproof jackets containing leaflets and brochures along with gifts (soap, thread and needles, tooth brushes, crayons, etc.) 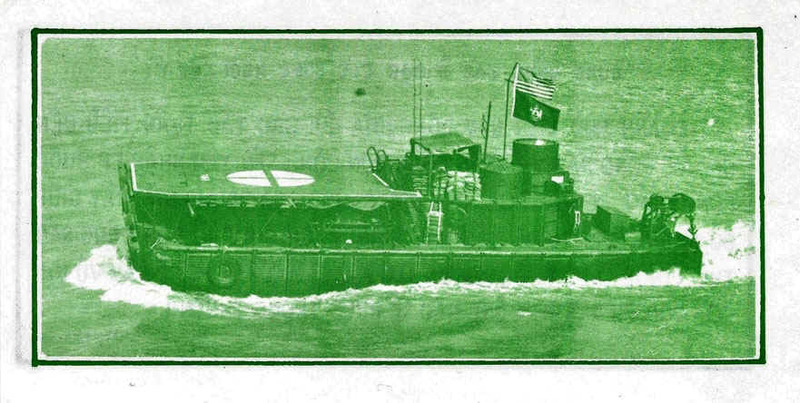 floated into the targeted areas by means of numerous canals and waterways of IV Corps. Arrangements were made with the Binh Thay Naval Base S5 (Civil Affairs) to supply the 10th POB with detailed intelligence of the targeted groups in the river target areas and a means of delivery. 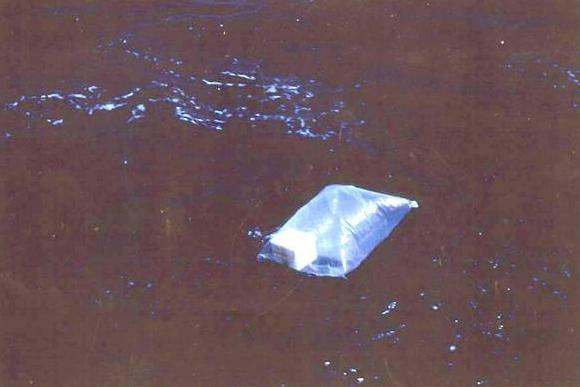 A search was made for a source of cellophane bags and a bag sealer. A lieutenant who was involved told me that he had written to his wife at home asking for her to find the cellophane bags and a hot iron to seal them. He said that the project was not a success, sealing the bags produced only a marginal closure and some of them leaked. Operation Tintinnabulation was a new Propaganda technique being tested by the 10th PSYOP Battalion, in cooperation with the 5th Special Operations Squadron, was recently employed against two VC battalions. Tintinnabulation (which literally means the ringing of bells) involves two C-47 aircraft, one "Spooky" (minigun-equipped) and the other a "Gabby" (loudspeaker-equipped). During the initial phase, the Gabby employs a frequency pulsating noisemaker designed to harass and confuse the enemy forces during night hours, while the Spooky provides air cover. During the second phase, the harassing noisemaker continues, however, emphasis is given to use of Chieu Hoi tapes. The first phase is designed to eliminate the feeling that the night provides security to the target audience, while the second phase is designed to reinforce the enemys desire to rally. Targets for both phases are recommended based on the results of daytime ground operations. During a recent operation in Vinh Long Province, a total of 24 missions were flown with over-the-target time of approximately 2 hours per aircraft. 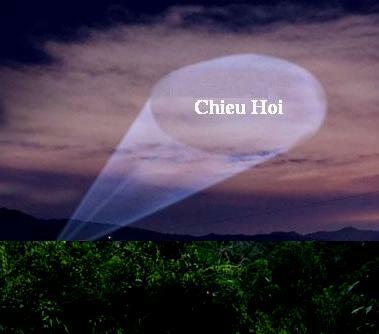 The number of Hoi Chanhs in the province more than tripled (122 in September to 379 in December), and ralliers stated that the effects of the night missions caused them to rally. The initial success of Operation Tintinnabulation suggested this concept should be considered for use in other areas. A November 1968 report states that phase I of Operation Tintinnabulation ended on 14 November. A night operation, this phase utilized the C-47 aircraft and speaker system with the frequency pulsating generator (Noisemaker) and various tapes of eerie music designed to eliminate the feeling that the night provides security to the target audience. Phase II was initiated on 15 November and incorporates the use of loudspeaker and C-47 aircraft equipped with mini-guns to suppress ground fire. Specially designed tapes based on Hoi Chanh feedback are used in this phase. 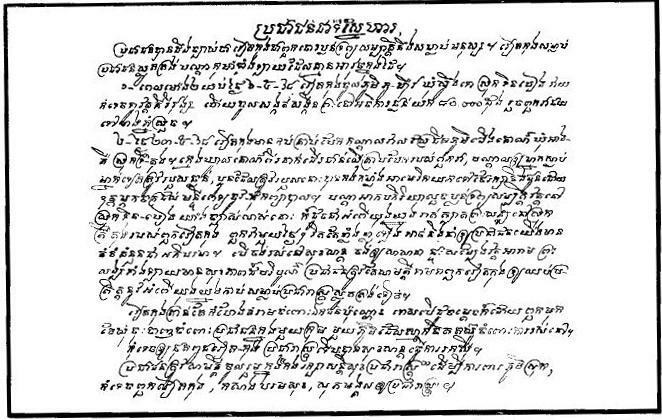 On 19 November, 16 Hoi Chanh rallied and 14 of them stated that the night loudspeaker  gunship operations were a major factor in their decision to rally. 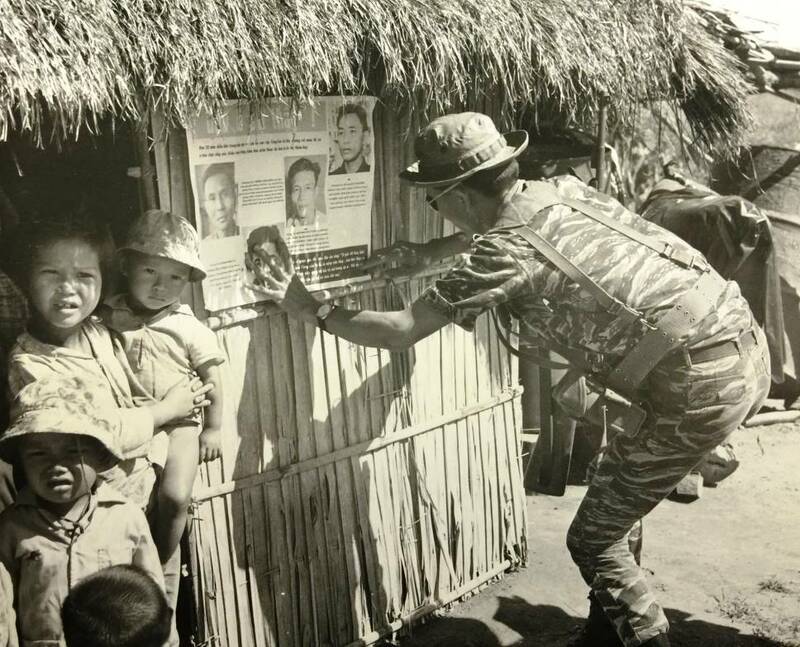 This official military photograph dated 8 October 1969 depicts a member of an Armed Propaganda Team placing JUSPAO propaganda poster 2680, Where is the Truth, to a hut in a small hamlet near Phan Thiet in southern II Corps. The faces on the poster are all former high-ranking VC officers who returned to the government under Chieu Hoi. The 10th PSYOP Battalion worked with many Armed Propaganda Teams (APTs). U.S. policy proclaimed that the propaganda teams must be regularly committed to PSYOP missions and used in a size force required for the mission. The APT are best employed by platoon, or at the very least by squad. Company sided operations should not be overlooked. Every operation must accomplish specific tasks; a walk in the sun does not contribute to the pacification effort. We also find mention of the best way to utilize the teams in Employment of US Army Psychological Operations Units in Vietnam, dated 7 June 1969. The booklet says that proper use of the Armed Propaganda Teams can be the most effective PSYOP medium directed against the enemy. 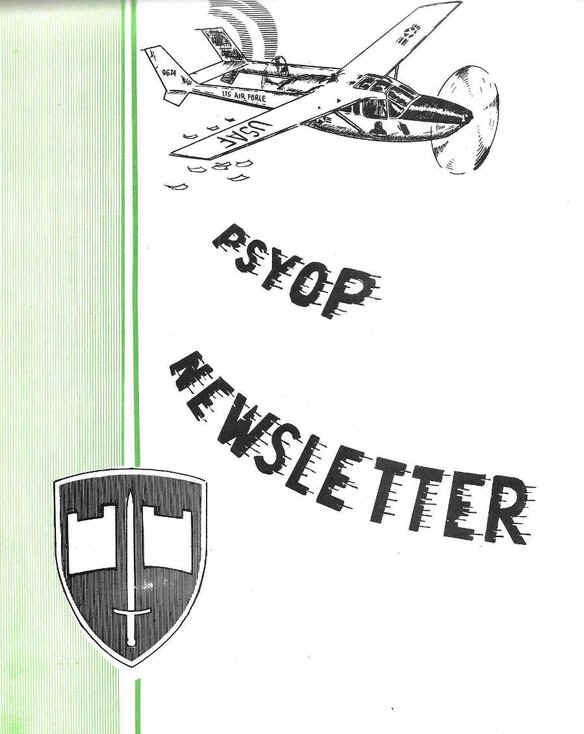 Starting in December 1968, the 10th Psychological Operations Battalion employed PSYOP advisors with Armed Propaganda Teams in IV Corps Tactical Zone to assist in training. The unit reported that the VC contested or controlled areas provided the ideal environment for Armed Propaganda Team operations. The security and ambush site may be maintained overnight to intercept Viet Cong members traveling to or from their hamlets. The 10th PSYOP Battalion reported that the Armed Propaganda Teams was the most effective PSYOP weapon in penetrating Viet Cong havens and striking at the enemy from within its own perimeter. Among the suggestions are: Armed Propaganda Teams should be used in the Viet Cong contested or controlled areas and should operate as a platoon size, highly mobile unit. The platoon should be divided into three squads with one squad designated to disseminate the PSYOP and two used for security purposes. The two security squads should be heavily armed to provide the protection essential for the conduct of face-to-face communications by the PSYOP squad. The PSYOP squad should consist of ex-Viet Cong members who have rallied from that operational area. The PSYOP squad need not be heavily armed as its primary mission is to conduct face-to-face communications and to root out the Viet Cong infrastructure. The security squads and the American advisor should not enter the hamlets but establish security cordons and ambush sites near likely avenues of approach into the hamlet. Heavily armed personnel moving into a hamlet are considered detrimental to the work of the PSYOP squad. After security is established the PSYOP squad should visit door-to-door in the hamlet to talk with families and distribute propaganda material through face-to-face communication urging the family and friends of Viet Cong to encourage the insurgents to rally to the Government. Leaflets dropped from helicopter gunships in contact with the enemy are an excellent PSYOP weapon as they reach the target audience while they are receiving fire, or when they are confused and disorganized immediately after an attack. Paper bags containing 1,500 leaflets are an excellent delivery method for dropping leaflets from a gunship. The bag will tear if grasped properly when it is dropped. A box of six such bags provided an adequate supply of leaflet without adding excess weight to the helicopter. The Media Production Section of the 10th PSYOP Battalion accomplished further Vietnamization. One entire shift of printers is now composed of Vietnamese Army personnel with Americans serving as their advisors. One half of the members of another shift are Vietnamese who have had less experience in the printing plant and require closer instruction and supervision by U.S. personnel. The Government is looking after the peoples health in Song-Ong-Doc District. These people are always ready to help you. If you get sick, dont hesitate, come and allow them to cure you. Are destroyed homes the purpose of your struggle? Do not permit the North Government to lay waste to our land. Do not help them in this unjust cause. Return to your government and help us return to the job of building our nation. 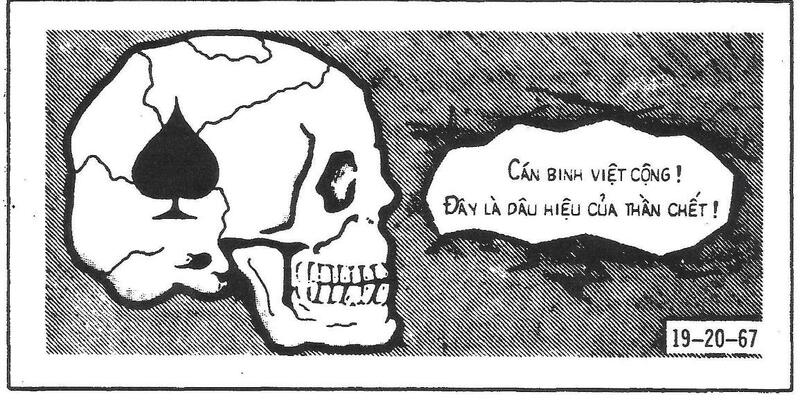 The Viet Cong offers the peoples dead bodies as Tet donations to the Communist Party. In 1969 the Advanced Research Projects Agency of the Department of Defense studied the effectiveness of U.S PSYOP leaflets in Vietnam. A sample of 1,757 Vietnamese was used to represent the target audience. They included the inhabitants of Viet Cong controlled areas, Hoi Chanh who had defected, and prisoners of war. The questions asked of the panels was the effectiveness of symbols, appeals both locally and national, and the vulnerability of certain groups. Leaflets were judged on a scale of very good, good, fair, bad, and very bad. One problem was to reduce the number of leaflets to a workable size. In this test, 798 leaflets were judged and the leaflets were reduced to 77. Unfortunately, the report did not explain why certain leaflets were good or bad. Leaflet 10-153-68 was rated VERY GOOD by the panel. 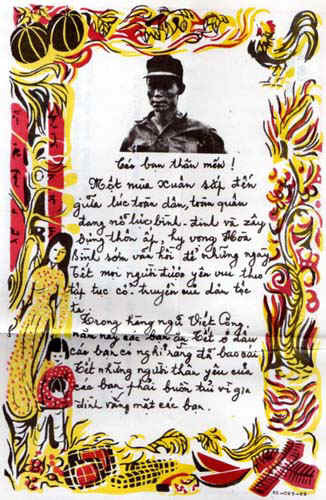 Leaflet SP-10-157-68 is a letter written from a mother to her beloved sons who are members of the Viet Cong. She expresses her sorrow and worries for the lives and future of her sons. Therefore, she tells them to go home through the government open arms program. Here, the weapons, explosives and hand grenades which the Viet Cong planned bringing into Can Tho City to kill people are shown. People should closely cooperate with the National Police to destroy any plot of the so-called National Liberation Front. and overran the Viet Congs base. In the operation, the Phong Dinh National Police forces captured: 225 cakes of TNT explosives and detonators, 263 hand grenades, one B-41, one AK-47, and large quantities of ammunition and documents. Let it be known that the Viet Cong are murderers. They killed defenseless innocent people and children. At 2:00 a.m. on 8 May 1968, the Viet Cong came to Phu Huu hamlet, Kuan To village, Tinh Bien district and beat open the door of the Kirivong Temple and forced two monks to hand over 80,000 piasters before withdrawing in the direction of Mui Nhan. On 25 May 1968, The Viet Cong placed a grenade in the middle of a rice field near Chan Ko hamlet, An Cu village, Tri Ton district. 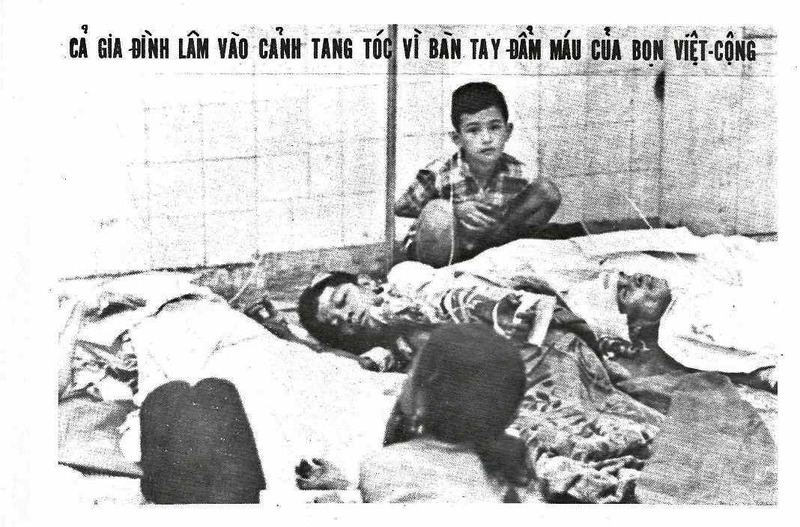 Two shepherd children stepped on the Viet Cong grenade, exploding it. It killed one child and seriously wounded the other. 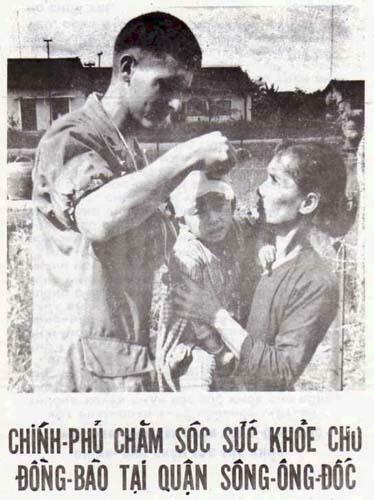 The wounded child was given first aid and brought to the Chau Doc hospital by U.S. Special Forces. 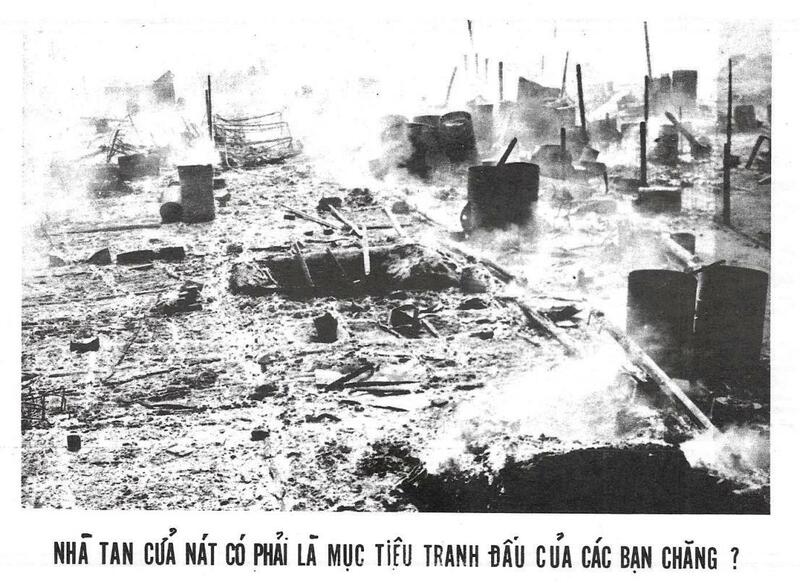 The despoilment of the temple property at Tinh Bien and the terrorism at Tri Ton by the Viet Cong roused the hatred and indignation of the people. If you, the people, want tom live happily with your religion and temples respected, you must unite and make the Viet Cong stop killing innocent people. The Viet Cong can threaten one or two people, but will surrender before all the people in a hamlet. When the Viet Cong is annihilated all the people will lead a calm life. HAPPY LIFE to publish every week. The activities of the Army, people, and cadres in Kien Giang province. That thousands of tons of metric rice are eaten by rats every year. That thousands of metric tons of secondary crops have been given to rats every year. That thousands of human lives have been snuffed out by the fleas brought in on rats backs. Join the rat control campaign beginning right now in your province, district, village and hamlet. Everyone join the rat control campaign. Use you rat-killing skills; fill your rice fields with rice. Kill the rats to protect your crops and increase your production. Visit your Provincial Agricultural Cadre for information and material on the killing of rats. Spring is coming and all civilians and soldiers are endeavoring to pacify and build up the villages and hamlets. They hope peace is restored soon so the people can enjoy a happy New Year, which is the custom of our people. Where will you be during the coming Tet, in the ranks of the Viet Cong? Dont you think that your family is waiting for you to return for Tet? This calendar is offered by IV Corps Headquarters and Tactical Zone Headquarters. Dont give rice to the Communists or join the Communist ranks. Dont accept the coalition attempts and false peace moves of the Communists. The purpose of the elections in the villages and hamlets is to help eliminate the Communists. This leaflet was printed by the 10th PSYOP Battalion in 1969. The leaflet depicts an Armored Troop Carrier. An ATC could carry a full infantry platoon. It was armed with three 20mm cannon or an Mk 19 automatic grenade launcher and two 20mm cannon, up to two .50 caliber machine guns and four 7.62mm machine guns, two Mark 18 40mm grenade launchers, plus various small arms, the ATCs not only landed troops, but also re-supplied them and provided close-in fire support during operations. 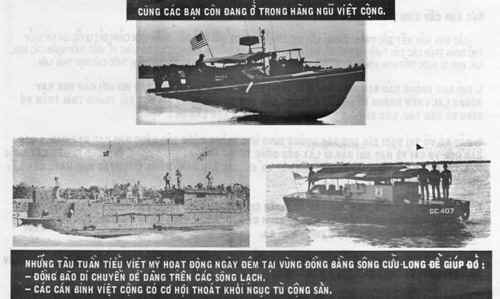 The Government of the Republic of Vietnam sends patrol boats to protect you, to block communist infiltration, and to prevent the Communists from forcing you to pay taxes to them. You should help the patrol boats by telling them where Communist tax collection points are located, if you have precise information on those locations, or by telling them the locations of Viet Cong weapons caches. You will receive a reward. On 16 April 1971 the 10th PSYOP Battalion was inactivated in Vietnam. 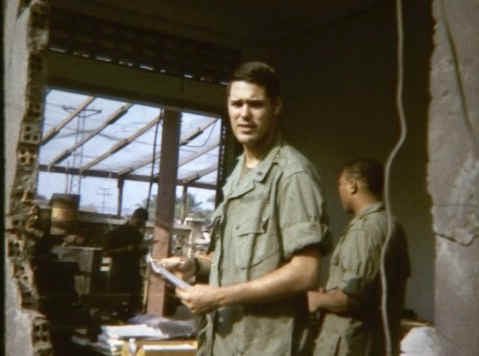 Although the 8th PSYOP Battalion was never sent to a war as a full battalion after Vietnam, there are numerous occasions when selected individuals and teams from its Reserve Companies did deploy. Some of those deployments are Operation Desert Storm, Haiti, Kosovo, Guatemala, and Panama. Specialist Matthew Osborne, a psychological operations specialist with the 307th Tactical Psychological Operations Detachment, 10th PSYOP Battalion, passes out radios to Afghan National Police in Subdistrict 1 of Kandahar City, 11 July 2011. The ANP then passed out radios to community members. 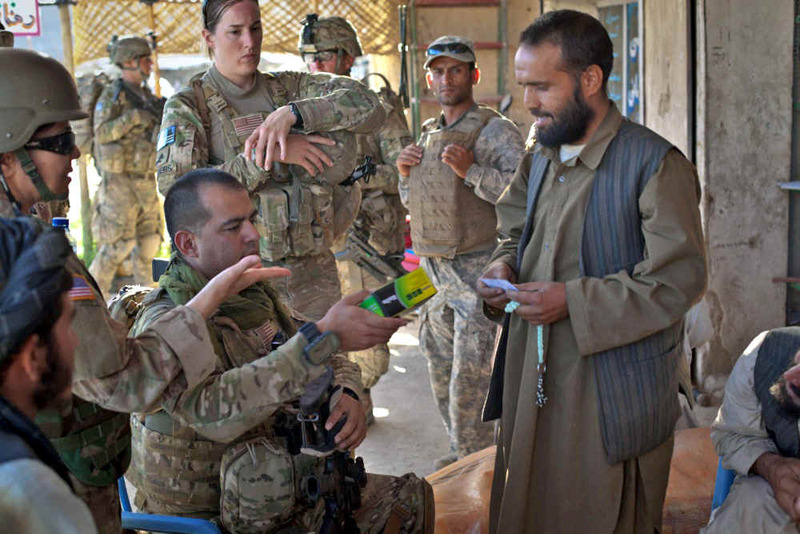 Staff Sergeant Sostenes Rocha, assigned to 307th PSYOP Company, 10th PSYOP Battalion, speaks to a local Afghan man and distributes radios during a mission to patrol the streets outside of Combat Operating Post 8-1, in downtown Kandahar City, Afghanistan. The objective of the mission is to set up tactical control points to search vehicles and occupants, and to gather information from the general population. The people often are bothered by the checks and will become belligerent. The PSYOP troops using loudspeaker and face-to-face communications can explain the need to search for weapons, explosives and even drugs. 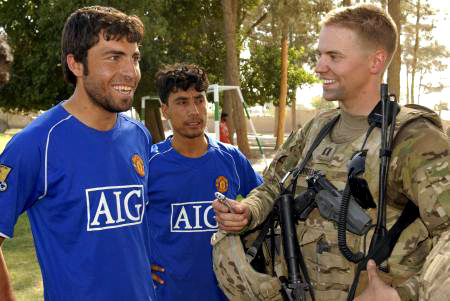 Captain Chris Strelluf, a member of the 308th PSYOP Company, 10th PSYOP Battalion, interacts with local soccer players 8 June 2011 during a ribbon cutting ceremony which signified the official opening of a new soccer field in subdistrict one of Kandahar City. 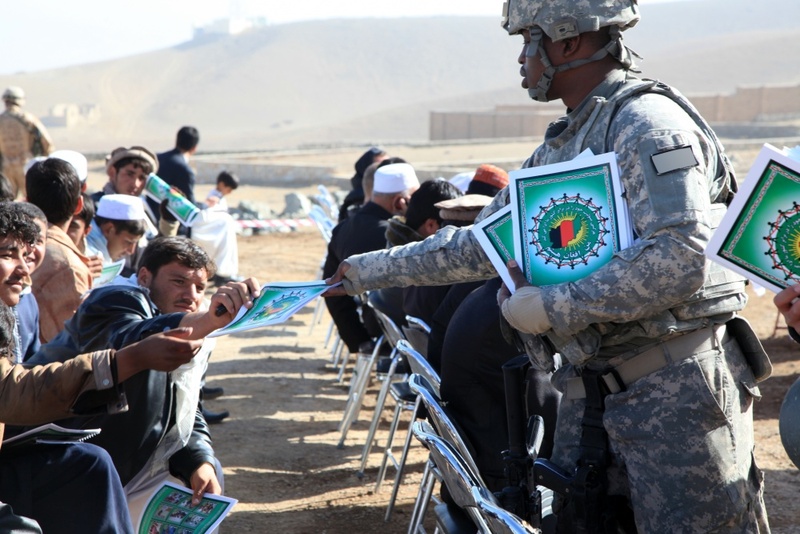 The new field was one of many projects headed by Task Force "Raider" and their Afghan national security forces partners in their joint-reconstruction efforts to improve quality of life, safety and security for residents of Kandahar City. Task Force Raider was made up of Afghan uniformed forces and men from Troop C, 3rd Squadron, 4th Cavalry Regiment, to clear a village in eastern Afghanistan's Nangarhar Province. Improvised explosive devices had been found in the roads surrounding the village, so they devised a plan to find the culprits. In the past, when U.S. forces came by themselves, it was seen as disrespectful to the local people. When U.S. and Afghan forces work together to search their houses it is more acceptable. Afghan culture is very important, especially when there are females in the house. When the forces work together, they can observe the culture properly. Beyond the Horizon is a joint foreign military interaction and humanitarian exercise sponsored by U.S. Southern Command that involves hundreds of U.S. service members representing the National Guard, Army Reserve and active forces. Since its inception in the mid-1980s, U.S. troops have deployed annually for this exercise which takes place in different countries as designated by U.S. Southern Command. These units deploy for short periods of time to support and implement agreed upon tasks developed during the planning phase. 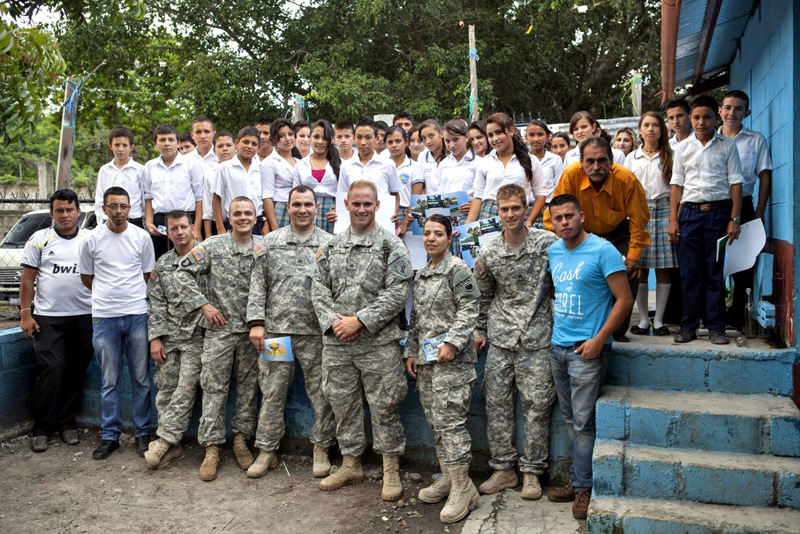 In 2016 the exercise ran from April to June and resulted in the 10th PSYOP Battalion taking part in building three new clinics and two new schools for the people of Guatemala. The three new clinic facilities included medical equipment and hygiene kits. The school buildings with fitted with classrooms, digital computers, desks and chairs. U.S. military health care professionals will conduct multiple Medical Readiness Training Exercises (MEDRETEs) in each country, working with host nation medical personnel to provide general and specialized medical and dental services to thousands of citizens requiring care. These services include public health and preventive medicine, dental care, adult and pediatric medicine, medical education, immunizations, and nutritional counseling. The exercises also include veterinarian care, a vital service that ensures the safety of valuable food sources and helps prevent diseases that could be passed from animals and livestock to a population. 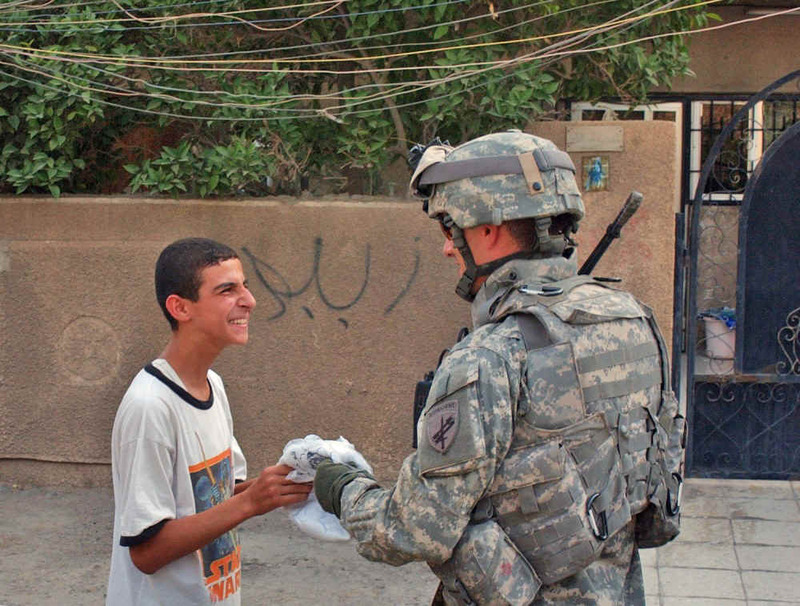 Staff Sergeant David Ingram from 318th Tactical PSYOP Company, 10th PSYOP Battalion, gives a local boy a soccer ball during a patrol in the southwest Rashid area of western Baghdad, Iraq in May 2007. 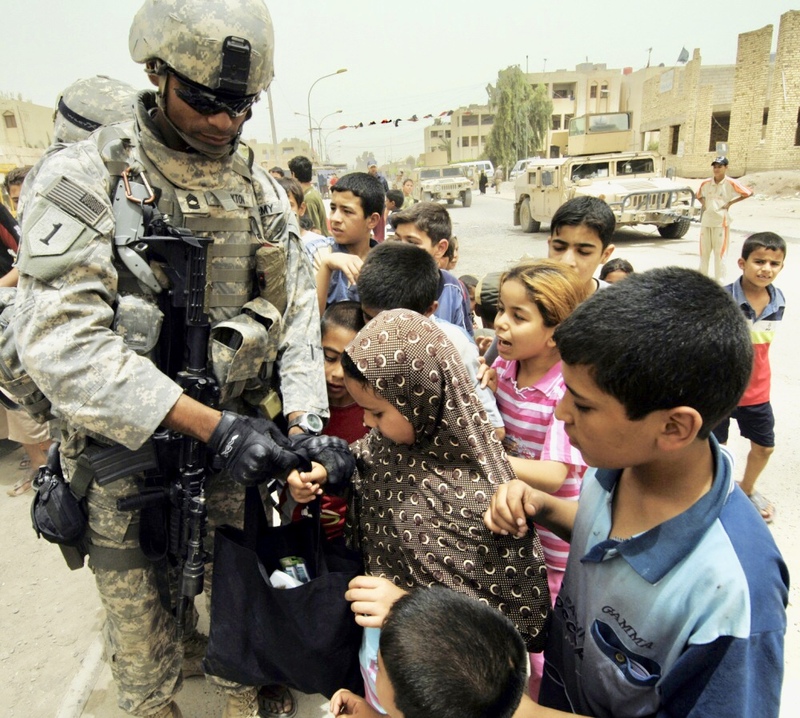 318th PSYOP Company soldiers from the 10th PSYOP Battalion assigned to Tactical PSYOP Team 1484 hand out toys and clothes to Iraqi civilians at Mahmudiyah, Iraq on 9 June 2007. 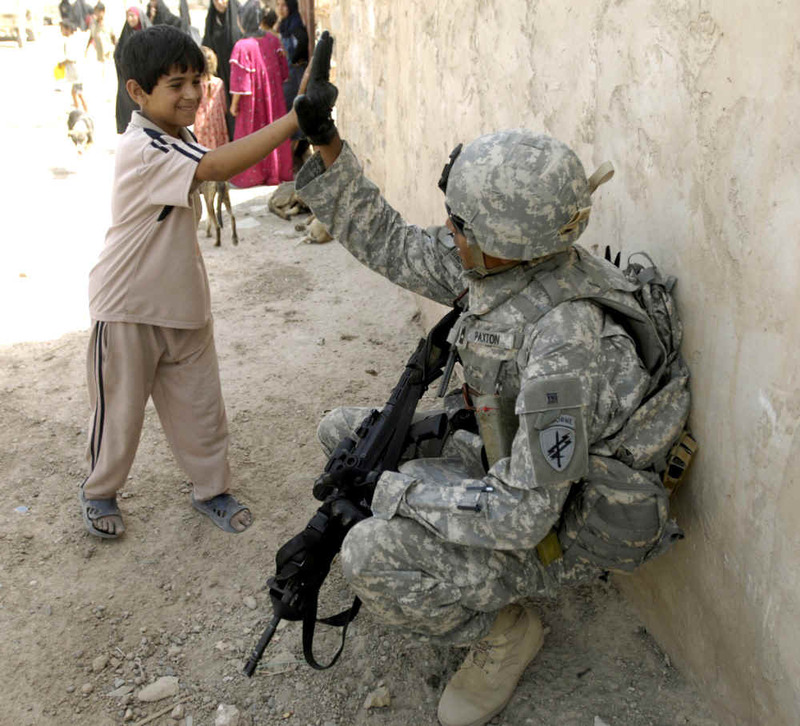 A PSYOP soldier receives a high five from one of the local children after soldiers from the Tactical PSYOP Team 1484, 10th PSYOP Battalion, handed out 1500 pounds of food and other items to Iraqi locals in the village of Al Murtada, Iraq. 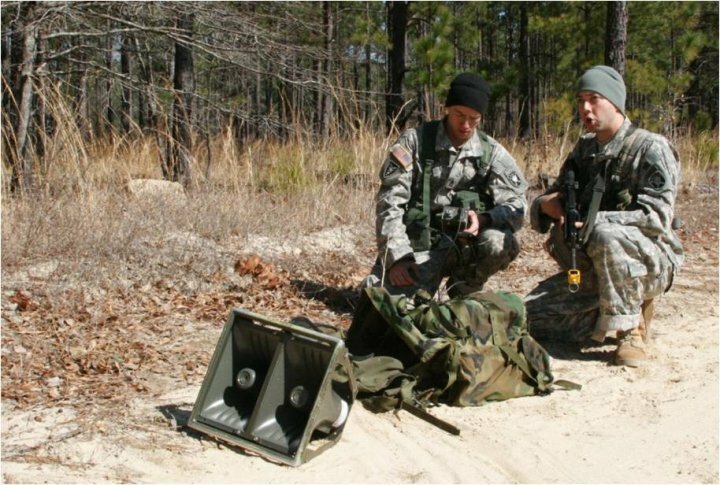 Soldiers of the 308th PSYOP Company, 10th PSYOP Battalion, set up a loudspeaker while attending the PSYOP Qualification Course in October 2010. Specialist Timothy Jones from the 318th PSYOP Company, 10th PSYOP Battalion, and Australian Defense Force Private Dirk Seelig install a speaker system for Information Operations while providing PSYOP support to the 7th Brigade as part of the Australian Defense Force participating in Talisman Sabre 2011. TS11 is a biennial combined training activity designed to train Australian and U.S. forces in planning and conducting combined task force operations to improve Australian Defense Force and U.S. combat readiness and interoperability. Global War on Terrorism Campaign for units deployed abroad in support of Operations Enduring Freedom and Iraqi Freedom. This ends our very short look at the history of the United States Armys 10th PSYOP Battalion. Readers who wish to comment or send further information are encouraged to write the author at Sgmbert@hotmail.com.